Before he was writing and directing potent cinema, filmmaker Erik Poppe began his career as a cinematographer and press photojournalist. That experience has shaped his perspective on a secondary level by offering an intimate, almost voyeuristic eye at the stories he'd told, most memorably in his 2008 drama Troubled Water, a complex look at the psychology and guilt of a recently-released prisoner. For 1,000 Times Good Night, however, Poppe draws his attention towards material that's much more biographical in nature: the story of a war-zone photographer whose brush with death leads to her questioning whether she should continue her dangerous pursuits or rededicate herself to her husband and two daughters. While it sacrifices grounded drama for sensationalist scenarios and overwrought family quarrels, Poppe's appreciation for the profession itself channels into an valid depiction of her conflicted grasp on the call to journalistic duty ... until trite developments at the halfway point force everything out of frame. 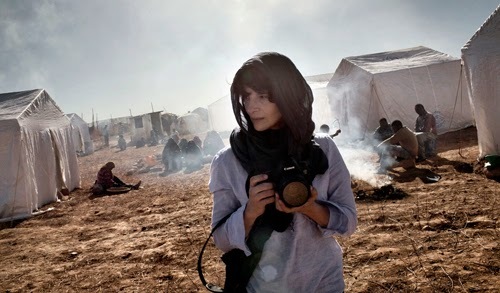 It was just a matter of time before a situation became too much for Rebecca (Juliette Binoche), whose daring photographic work through war zones across the globe has earned her an esteemed professional reputation. This time, while embedded deep undercover in Afghanistan, she simply gets too close to the action: a bomb goes off near her location that does severe damage, sending her to the hospital. Following the incident, Rebecca returns home to Ireland to her husband (Nikolaj Coster-Waldau), a marine biologist, and her two daughters; her youngest obsesses over presents and pets, while the eldest (Lauryn Canny) begins to develop her own interests as she juggles concern with her mother and schoolwork. While home recuperating from the blasts, Rebecca has time to reflect on the sacrifices she's made to get to where she's at and whether she wants to continue working in war zones, a decision looming in her mind when she's offered a guaranteed safe photography gig in Kenya during her absence. Despite the opening scene containing more unlikely photojournalist fantasy than authentic introduction to Rebecca's motivation, 1,000 Times Good Night harnesses the potency of her profession as a dramatic focus instead of a mere plot device. Enhanced by stunning images she's taken over the years, many of which are convincing photos despite being shot for the film, director Poppe guides the audience into Rebecca's mind -- and her perspective at the locations -- for a look at the conflict between the necessities of dangerous work and the necessities of being a mother. With that in mind, the journey into Rebecca's perspective also paves the way for elevated dramatics once she learns exactly how her profession has drained the goodness from her family relationships, leading to awkward expressions of Rebecca trying too hard to participate and regain a grasp on safety. These rich personal scenes might have gone over better with a different lead, because Juliette Binoche's otherwise robust talent comes across as too rigid and detached for the demands that 1,000 Times Good Night places upon her character, forcing the film's concept to succeed around her instead of through her. The passion for photography and family surrounds Rebecca's character through her sacrifices and her need for people to see the areas she's shooting, but Binoche's regular chilly attitude kept me at arm's length from her internal turmoil, forcing me to follow her family's responses to her instead of her own. A bearded and heavy-eyed Nikolaj Coster-Waldau proficiently wears the strain of a husband who constantly anticipates a call about his wife's death or injury, though, which assists those sequences where it's tough to decipher Rebecca's internal thoughts and moods. Perhaps that's intentional at times, rendering an almost soldierly disposition for this mother of two, but it depletes the story's potential when she's forced to choose between a return to active duty or to remain with her family. Despite the questionable nature of Binoche's performance, 1,000 Times Good Night perseveres on its subtler ambitions of depicting Rebecca's reintegration into her family's life as a permanent fixture, how she's able to curry their favor while dealing with the possible surrender of such a large part of herself. That makes it all the more frustrating to see how director Poppe leads Rebecca's story down such a predictable path once she's offered a guaranteed "safe" photography opportunity in Kenya, in tandem with her elder daughter's research project into Africa. What results is a far more literal and ham-fisted choice between one's call to professional duty and one's dedication to their responsibilities, and the resulting messy domestic drama hinges on Poppe's willingness to push his character into a flawed, complex mental space. Rebecca's waning grasp on safety and the necessity to lend exposure to other people's conflicts should bring things more into focus, but instead it develops into an overblown, skewed snapshot of its promising subjects.